“What memories hallowed by a thousand sunny recollections, does not the name of Christ recall. The greatest reformer of his time—the grandest character the world’s history possesses. The holiest and hence purest of men: by some a hero, by others a divinity. The God-man. Nazareth. Jerusalem. The alpha omega of His divine life. . . . What adds luster to all His greatness and beauty is the fact that He was a poor humble carpenter—a son of toil, thus adding honor and dignity to the man who labors by the sweat of his brow. That all should do so is a command of God. He who shirks this responsibility is a drone, a clog upon the wheels of life. . . . To point with pride that the greatest, the holiest and grandest of men was a lowly workingman of the bench, the man of hammer and nails, and whose greatest heritage and glory was that same fact . . . proves that divinity is near the laborer, the man who works for his daily living, than the debauched cruel selfishness of wealth. . . . 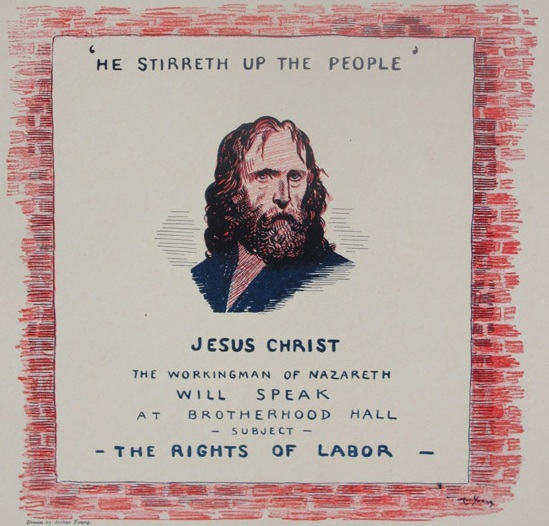 It proves that the cause of Labor is holy; that God honored and dignified it, and as such is the grandest heirloom given unto man. . . . Then, to defend labor is a virtue. To deprive it of lawful rights, to strangle it by insideous laws, reptilish and barbarous, an evil, a sin, and a crime against the mandates of the Creator himself. In such a cause prison bars are jewels grand; prison cells consecrated halls to God and man.! . . .
Murphy O’Hea, “Christ,” The Railway Times, 1 November 1895. The Ballad of the Carpenter may have been the most blatant song Phil recorded about Jesus, but it is far from the only reference Phil would make to the alleged son of God. Jesus appears to have been a favourite topic for early-sixties folk singers. In his sleeve notes to his album ‘Where Have All The Flowers Gone?’ Pete Seeger wrote “Once again, the metaphors in that great old book, The Bible, keep getting reworked”. Simon And Garfunkel’s debut, ‘Wednesday Morning 3 A.M.’ for example contains several Christian-lite songs, such as You Can Tell The World and Go Tell It To The Mountain (and also contains Last Night I Had The Strangest Dream, which also made its way into Phil’s earliest sets, and I used to sing in Welsh in school). It’s a little odd to be honest. Not only does the apparent conservatism of Christianity sit uneasily with the bohemian style that was all the rage, but both Paul Simon and Art Garfunkel are Jewish, as was Phil Ochs. Then again, so was Jesus. There is not a single mention of Phil’s Jewishness in any of his songs. And yet Jesus is everywhere. In Here’s To The State Of Mississippi (as well as Here’s To The State Of Richard Nixon of course) he appears as a symbol of fallen idols and as a contrast with the brutish forces of hate; “the fallen face of Jesus is chocking in the dust”. In Ringing Of Revolution he appears as a symbol of hopelessness, “everything is lost as they kneel by the cross, where the blood of the Christ is still flowing”. In Christmas In Kentucky he is a symbol of empathy; “But if you knew what Christmas was, I think you would find, that Christ is spending Christmas in the cold Kentucky mine”. And in Where There’s A Will There’s A Way, he’s a civil rights symbol; “he went around the countryside preaching brotherhood”. Other symbols of Christianity also turn up in songs such as The Iron Lady, If I Knew, Rivers Of The Blood, The Passing Of My Life, As I Walk Alone, William Moore and Lou Marsh. A line is drawn between Jesus (and his message) and modern Christianity in The Cannons Of Christianity, suggesting that the Jesus that was such a positive symbol to Phil’s generation may not have been the same bloke that Billy Graham was banging on about. Phil’s key Jesus song however was Crucifixion, where Jesus becomes a symbol of all who become a victim of society’s bloodlust. Perhaps what is crucial here, is Phil’s weakness for martyrdom, of dying for a cause and having a cause worth dying for, a theme that is apparent in songs such as Joe Hill, The Bullets of Mexico, Lou Marsh and A Toast To Those Who Are Gone. Jesus then, emerges as the greatest martyr of all, a symbol far removed from the Jesus of conservative Christianity. I can’t help feeling that there is an element of mischief is the appropriation of Jesus as a Socialist hero. With Christianity as the bedrock of Conservative American society, calling into question the role that Jesus’s teaching has played in forming the reactionary values of the American Right may serve to call into question the values themselves. Ewan MacColl’s Jesus that emerges in The Ballad of the Carpenter is also a different one to the one that Phil refers to. MacColl notices how “wealth and poverty, live always side by side”. Jesus, gathers together working people and tells them “this world belongs to you”. His crime, the crime that leads him to the cross, was to anger the “rich men”. This theme is also present in Woody Guthrie’s “Christ For President”,; “the only way you can beat, these crooked politician men, is to run the money changers out of the temple, and put the carpenter in” and his “Jesus Christ” where it’s “the bankers and the preachers” who “nailed Him to the cross”. This is Jesus as Socialist hero. “You have lived in a Christian nation in which you are segregated, lynched, and burned. Even in the church, I understand, there is segregation…I am a Hindu. I do not understand. Here you are in my country, standing deep within the Christian faith and tradition. I do not wish to seem rude to you. But, sir, I think you are a traitor to all the darker peoples of the earth. I am wondering what you, an intelligent man, can say in defense of your position. Thurman’s reply described a Jesus who was poor, outcast and despised by the elites of the world, but in whom all the poor, outcast and despised of the world could hope. Those who read Thurman in the 1940s found him promoting belief in the “literal truth of God” but also exploringthe religious implications of social, economic and political conditions”. While the likes of Thurman (as well as Guthrie and MacColl) sought to politicise Jesus, with Phil it was more a case of secularising Him. The debate regarding whether Jesus would have been pro or anti-Capitalism has became rather wearing. Jesus has long became whatever you may want him to be. The fact that the Bible inspired both Dr King and the KKK is testament to this. Idealistic it may have been, but the notion of Jesus as an idol of the protest kids was obviously a powerful one. In contrast, there appeared little currency in utilising Jewish symbols, despite the prevalence of Jewish singers in the New York scene. It is perhaps no coincidence that David Cohen and Robert Zimmerman would de-Jew their professional names, becoming David Blue and Bob Dylan respectively. Similarly Ramblin’ Jack Elliot was born Elliott Charles Adnopoz. Phil’s only reference to Jews in his songs is in The Harder They Fall, which playfully, though somewhat inexplicably, refers to Mother Goose “stealing lines from Lenny Bruce, drinking booze and killing Jews” (perhaps a reference to the Goose stepping of the Nazi’s?). It may have been simply that Phil’s Jewishness was caught up too much in his antipathy towards his parents, that the Jewishness was theirs, and something that he had no apparent interest in. Indeed Marc Eliot notes that “being Jewish meant nothing to [the Ochs children], other than getting off school for the Jewish holidays”. And yet his Jewishness was a fact, and one that he seemingly chose to overlook throughout all the many songs he wrote. Christianity, or rather Jesus the man, was a far more popular, even cool, symbol. Jewishness, for whatever reason, was not. Phil would describe his young self as an “American nebbish” and referred to himself in a Broadside interview as a “comfortable, middle-class, Jewish guy” and yet never mentioned this in any song (though he did write a song called The Ballad of The Jewish Mafia, that was about Sonny Liston). In seeking to identify himself as a progressive American patriot, Phil’s Jewishness became sidelined. Perhaps it’s a simple case that Jewishness wasn’t an aspect of Phil’s identity that meant anything to him, much in the same way that being from Texas didn’t. In singing this song – the only cover version to appear on any of Phil’s studio albums – Phil was reaffirming a part of his identity that he was most certainly keen to promote – that of the left-leaning folk-singer. This isn’t just a case of Phil singing a song about Jesus; this is also Phil aligning himself with Ewan MaCcoll. Having written so many songs by this point and with so many unrecorded, it seems odd that Phil should choose to record a song written by somebody else. There is more going on here though than simply singing a song that he liked. In the sleeve notes to I Ain’t Marching Anymore Phil writes that “The state department has a nasty habit of blocking the entrance of Ewan MacColl into this country”. 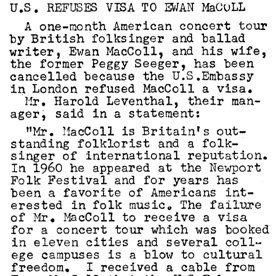 In the early 1960s Ewan MacColl was refused entry to the United States. According to Peggy Seeger, he was shown a six-inch dossier by the American Consul in London of all the surveillance reports they had on him, supposedly dating back to 1929. This was Phil’s way of paying tribute to someone who was fast on the way to becoming something of a martyr himself. Some ten years later Phil would cover MacColl’s Shoals of Herring, a beautiful song about fishermen in Norfolk, England. The contrast between the Phil Ochs who sang MacColl’s song about Jesus and the one who sang his song about fishermen is heartbreaking.